8:55, Pimpi kiss cradle on Chicano. Mamba left the match with an injury, returned post match to stop the rudos from attacking Pimpi and form an alliance with her long time rival. 4:53, maybe cut short after Tiger Boy suffered an injury on a dive. Mascara de Bronce pinned Raptor with a 450 after a brief 2 on 1. A rainstorm started affecting the show from here the rest of the night. 13:20, Parka bodyslammed Monster. Dave & Parka worked together fine, won, and then Dave attacked Parka. Cuervo & Scoria made the save. 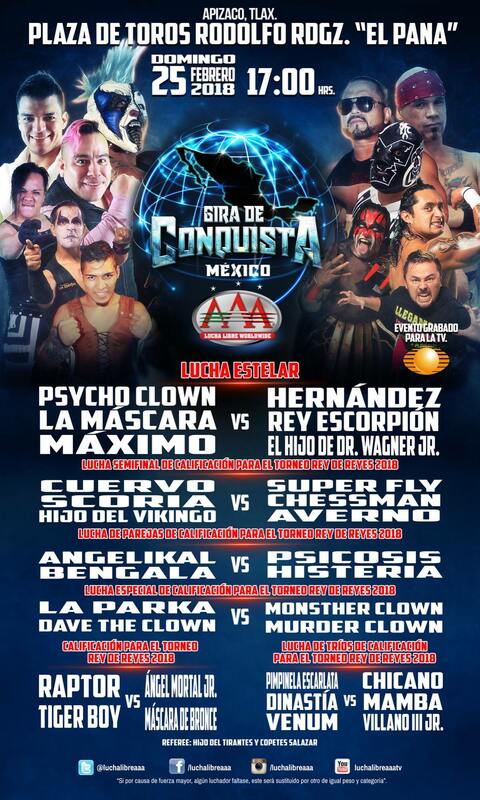 11:21, Bengala headscissors on Psicosis. Hijo del Tirantes refused to count three for the tecnicos until he finally did. Texano give Bengala a piledriver after the match. 9:15. 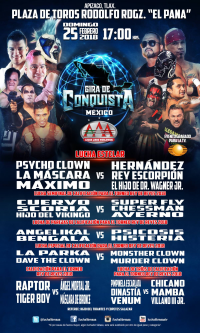 The Traidor Clowns attacked Cuervo & Scoria, only for La Parka to clear out all the rudos and set up Averno for a Hijo del Vikingo reverse 450 splash. 20:47. Dr. Wagner (with the debuting Samaono) made the save for the tecnicos in the main event after a ref bump, and the tecnicos pinned all the rudos.